The box was big, but light--and not addressed to me. Even the postwoman remarked how light the large box was. And from the U.K.? M hadn't mentioned ordering anything, especially something from overseas. I suppose I should have been a little suspicious when M said, "You open it." But I wasn't. And all the better for a complete surprise! It was a mudag! If you have been following this blog, you will have seen my photo of a mudag at the National Museum of Scotland (NMS). 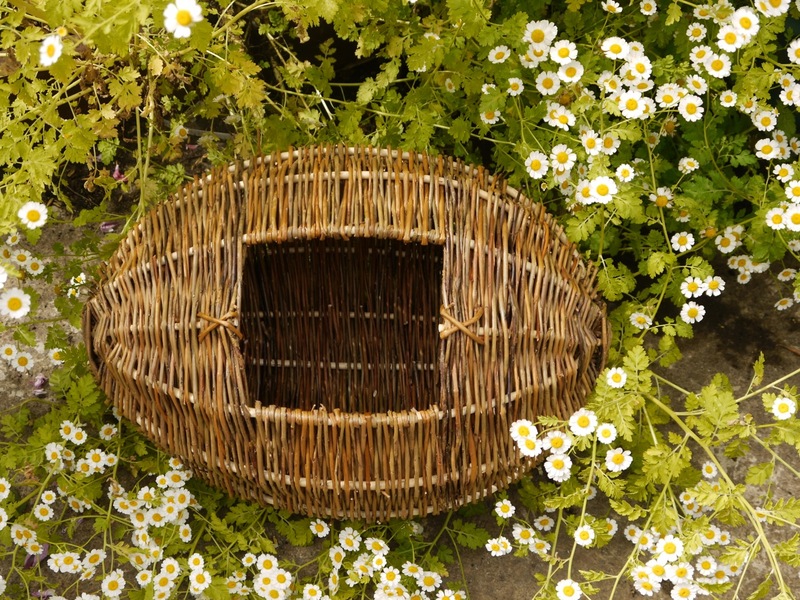 I loved the simple and practical woven willow basket made for storing wool for spinning at first sight. I confess that I was so taken with the unusual basket that I considered trimming branches from a weeping willow tree that had been downed in July's storm. Some common sense prevailed because I didn't. That is certainly because I am not a basketmaker--and not because I wouldn't like to be. I must set some limits on my omnivorous approach to fiber arts. Knowing how much I had admired the basket and a little concerned that I might carry through on my 'thinking out loud' and carry my pruning shears down the road, he secretly started researching the baskets. For one, they're known as mudags. According to Woven Communities of Scotland, they are also known as muirlags, mulags, crealaghs or craidhleag. The one in the NMS, which was labeled only as a wool basket, was collected on the Isle of Skye in the Inner Hebrides where it was known as a crealagh. What is known about the baskets is described in more detail here. 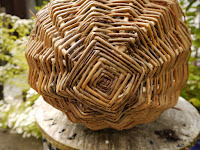 M also found Liz Balfour, a basketmaker in East Lothian, Scotland. 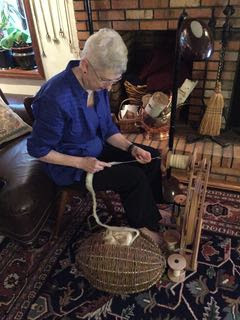 One of the founders of the Scottish Basketmakers Circle, she says, "The Museum basket was the one I copied originally many years ago but I have seen quite a few since then. They are rare and only a few survive in museums." Besides the fact that mudags were woven for utility rather than for beauty or artistic expression, there is speculation that few have survived intact because the basket was often kept near the fire to keep the wool warm and easier to work. Some surviving baskets are burnt on one side. Resources indicate that most modern mudags are based on the photograph and dimensions of the mudag collected by Dr. Evelyn Baxter on the Isle of Skye and recorded by Dorothy Wright's in her book, "The Complete Book of Baskets and Basketry." Mine is about the same size she records: 19.5" long, 12" diameter with an opening of 6.5" x 5.5," but differs slightly with its God's Eye on each end. There are no feet so, ostensibly, it can roll. But it doesn't. It just sits beautifully by my feet. In retrospect, I'm glad I didn't try this on my own. For one, the willow used in the baskets isn't from the tree, but from a shrubbier species. 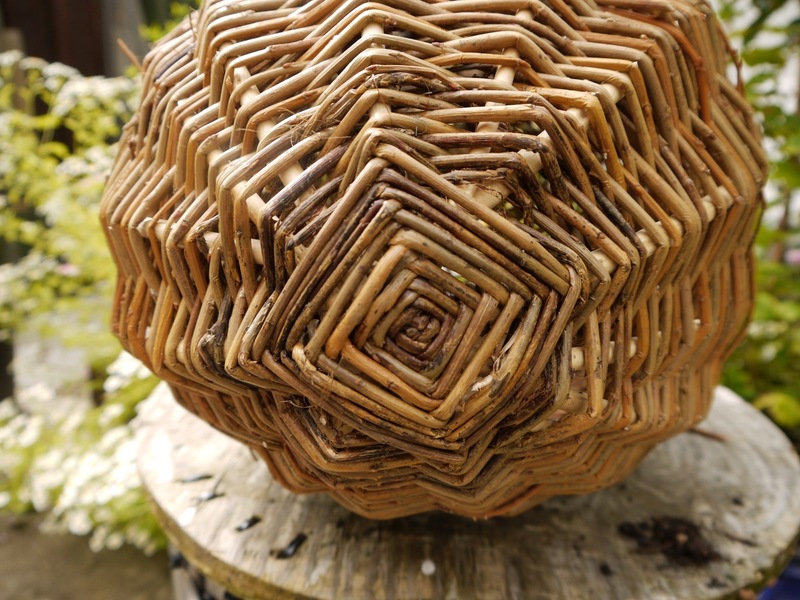 One U.S. basketmaker grows 60 varieties of the genus Salix, but none look like the tree. Makes perfect sense. For another, mudags are difficult to make even for experienced basketmakers. One unidentified basketmaker recounts her experience recreating one for the Highland Folk Museum. I am delighted to have such a beautifully crafted mudag--and grateful to have a husband who so thoughtfully supports--indeed, feeds!--my love of unique and beautiful handcrafts. My mudag is full of wool roving--so I depart somewhat from the traditional storage of fleece or rolags. Rewarding as carding wool and making rolags may be, it's time consuming. And since my list of 'want-to-do's' is long, I need to take some shortcuts.